RANGERS produced an improved performance, but were undone by Tom Ince’s late, late strike at Loftus Road. Following three defeats in as many matches, the R’s were arguably the better team against in-form Derby County, especially in the second period. However, it was the visitors who would ultimately prevail, scoring in the 86th minute – with just their third shot on target – for a seventh straight Sky Bet Championship victory. Ince did the damage for Steve McClaren’s men, rifling home from 16 yards following substitute Abdoul Camara’s left-flank assist. Following Saturday’s 1-0 loss at the hands of Rotherham United, R’s boss Ian Holloway made one change to his side for the visit of Derby. James Perch’s return from suspension saw the full-back drafted into the side, at the expense of Sandro, who dropped to the bench. In a 4-3-3 formation, Rangers lined up as follows: Alex Smithies; Perch, Nedum Onuoha, Joel Lynch, Jake Bidwell; Jordan Cousins, Grant Hall, Massimo Luongo; Tjaronn Chery, Conor Washington, Yeni Ngbakoto. There was little to note very early on. But Derby goalkeeper Scott Carson had to produce a fine reaction stop in the sixth minute. He tipped over from Chery's rasping 18-yard drive, following Washington’s lay-off. Eight minutes later, meanwhile, good football by Perch, Chery and Washington ended with the latter shooting low at the Rams’ custodian from just inside the box. Derby had a goal ruled out for offside in the 15th minute, following their first meaningful attack of the contest. After Lynch’s misplaced pass, Ince eventually wheeled away after shooting beyond Smithies – but the linesman’s flag halted the visiting celebrations. A few opportunities discussed there but, in truth, clear-cut chances were virtually non-existent in the first half. Six minutes before half-time, Ngbakoto forced Carson into a smart tip over the crossbar, while Ince shot straight at Smithies following a counter attack from the resultant corner. Washington also drove at Carson soon after. Rangers had probably marginally been the better team, though nothing more than that in what was a pretty unspectacular opening period. What would the second half bring? Five minutes after the break, Carson took no chances when he turned Cousins’ cross-shot from the right around the post, with the ball arrowing towards the near post. In the 53rd minute, meanwhile, Ngbakoto’s distance attempt flew over the target. As the hour mark approached, the second period had already witnessed more gusto than the first. Rangers went close in the 59th minute. Carson was unable to hold Chery’s initial effort, before Luongo’s follow-up shot was blocked away. QPR were now playing with a bit more confidence, and the Loftus Road faithful responded in kind, cranking up the volume a notch. In the 64th minute, Ben Gladwin was introduced for the R’s, with Chery making way. The game was now finely balanced. 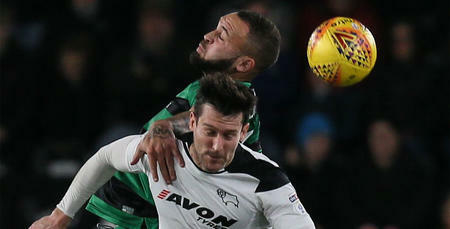 In the 68th minute, Derby’s Bradley Johnson shot low at Smithies from 25 yards. A minute later, Seb Polter replaced Washington for Rangers. With around a quarter of an hour left, both teams really were at stalemate. You felt that one goal could well settle this contest. Derby almost got that goal after countering in the 75th minute. However Ince, under pressure from Perch, drilled wide from 12 yards. Thirteen minutes from time, an injury forced the R’s into their third and final substitution. Cousins limped off, so on came Olamide Shodipo in his place. Shortly after his arrival, sub Shodipo received the ball in space 25-yards out, before blasting wide. Luongo then saw an effort deflect just inches past the post. But it was another sub who was heavily involved in the decisive goal of the game four minutes from time. Just eight minutes after his introduction, Camara’s low centre from the left bounced up kindly for Ince just inside the box, who duly leathered the ball home beyond a helpless Smithies. WATCH extended highlights from QPR's match against Derby County at Loftus Road.